I've known about these ridiculous magic wands for some time, because every alternative lifestyle, quackery and woowoo publication seems to carry large advertisements for them. Unfortunately the Australian operation has managed to con Layne Beachley, seven-times world surfing champion, national sporting hero and generally well-regarded person and has encouraged her to endorse the scam. I realise that Layne has to make a living somehow now that she has retired from professional sport but I wish she would go back to endorsing muesli bars or whatever it was she was promoting the last time I saw her on television. I really hate it when scamsters tarnish the reputations of celebrities by attaching their names to the celebrities' achievements. And is this a scam? The Complaints Resolution Panel of the Therapeutic Goods Administration thinks so. Here is the advertisement that caused all the fuss. You will note that it is full of testimonials from people who may or may not exist, plus a list of famous sports people who might have waved a magic wand over themselves at some time or other. And two chiropractors! Now THAT is convincing. And here is the notice that Scenar were supposed to run on their web site but have apparently been too busy to get around to showing yet. An advertisement for the Scenar device, which we published on this website, should not have been published. In the advertisement we made a large number of misleading, unverified, and unlawful claims. 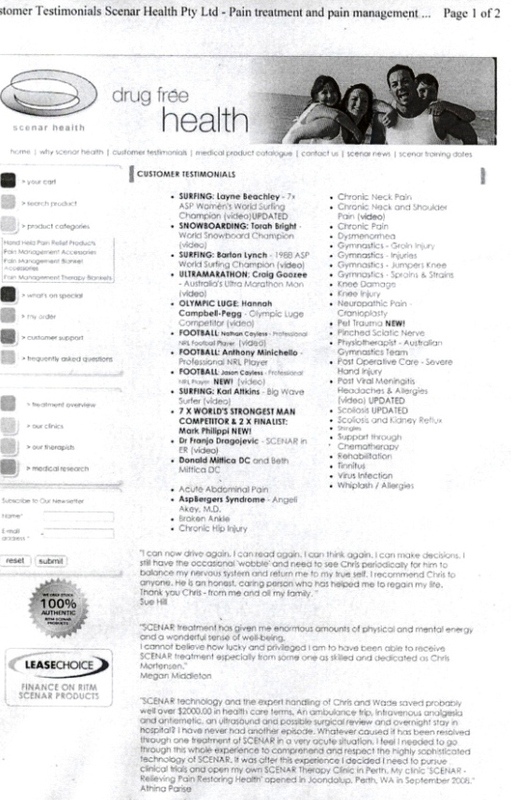 These included unlawfully made claims that the Scenar device could have benefits in relation to abdominal pain, neck pain, shoulder pain, chronic pain, broken bones, dysmenorrhoea, groin injuries, knee damage, headaches, allergies, scoliosis, kyphosis, shingles, tinnitus, viral infections, whiplash, and many other health conditions. A complaint about the advertisement was recently upheld by the Complaints Resolution Panel. We provided no evidence to support the claims we made, and the Panel found that the claims were unlawful, misleading, and unverified and breached the Therapeutic Goods Advertising Code. The Panel therefore requested that Scenar Health Pty Ltd publish this retraction. One day the government is going to give the TGA some teeth so that they can do more than just suggest that charlatans put notices on web sites, suggestions which can safely be ignored. The promoters of the SCENAR scam managed to get several minutes of free advertising on a "news" television program with a lot of viewers. I notified the program producers well ahead of air time about the CRP ruling but no mention of it went to air, just testimonials and bald claims. This provided material for an article I wrote for Yahoo!7 News.